Regular fans of Stage Door’s amazing collections from obscure, forgotten or neglected West End hits may already have enjoyed Lost West End and Lost West End 2. 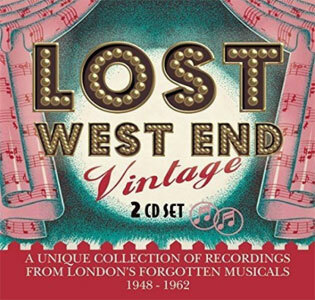 The latest release in the catalogue, Lost West End Vintage, takes you further back in the archives, featuring a staggering fifty-two tracks taken from musicals dating between 1948 and 1962, some of which have never been released previously on CD. The attraction of the collection, as well as shedding some welcome light into the darker corners of British theatre history, is the stunning weight of talent you’ll find. As well as those who were best-known for their musical theatre performances such as George Formby, Tommy Steele and Anna Neagle, you’ll find comedian Frankie Howerd, definitive Sherlock Holmes Jeremy Brett and pop star Cliff Richard to name but a few. This release is so big it is spread across two discs. There’s something for everyone (assuming a taste for older British musicals) and the sheer volume of songs makes for a rich and fulfilling listening experience. You may like the chirpy, flat-vowelled charms of George Formby, who would have been one of the biggest stars in the country when Zip Goes A Million hit the West End in the early 1950s. Similarly feel-good and sentimental is Anna Neagle’s turn in two songs from 1953’s The Glorious Days. Frankie Howerd, the legendary comic whose centenary is rightly being celebrated this year, sings Song and Dance Man from 1958’s Mister Venus with his customary comic lightness of touch. Remember Peter Gilmore from The Onedin Line? Turns out he could hold a note, too. Before his TV fame, he starred in Follow That Girl and sings the title track here. Of great excitement to this reviewer is hearing Jeremy Brett singing A Boy Called Johnny from the 1960 musical Johnny the Priest. Brett went on to star in the movie version of My Fair Lady, though (in an act of sacrilege) had his singing voice dubbed. He was a magnificent singer, as this song proves, and he never lost his taste for this era of popular songs – check out his duet with Twiggy on YouTube for proof of that. Brett finished his career as the definitive and never-equalled Sherlock Holmes in the 1980s/90s. There’s plenty of Tommy Steele on the second disc (comprising covers and rarities), and an outing for Cliff Richard too, with the song The Shrine on the Second Floor from the musical Expresso Bongo. If there’s a criticism of this release, it’s perhaps that songs from the same musical aren’t grouped together, which certain mindsets would prefer, and the sleeve notes cover the facts but don’t have as much detail about the musicals compared to earlier releases. Still, that’s what Google’s for! It’s not only some of these musicals that are forgotten, but the culture that created them. It’s perhaps fitting that the collection ends in 1962. If there was a birth of modern Britain, it was around about then, when the Beatles first arrived on the scene, along with cultural phenomena James Bond and Doctor Who. The austere post-war period of mourning, rationing and a desperate clinging on to the old ways finally caved in to rebirth and seismic shifts in the zeitgeist. You can hear it in this collection – the 1960s just around the corner. This is the last gasp and dying embers of a more structured and reverential musical theatre tradition. The sound of these songs belongs in a different epoch entirely. But for those who admire the cultural fruits of this era, Lost West End Vintage is a dream collection from bygone times, as well as a cracking selection of songs and performers.